I was just being aware of that verse from Psalms 48 and so I traveled to Israel to spend my 37th birthday in Jerusalem. This travel documentary is the first of two parts of my 3.5-day stay in Jerusalem as part of my 8-day Israel sojourn that also brought me to the Dead Sea & Masada, Tiberias (Sea of Galilee), Nazareth, Cana, Tabqa, Capernaum, Mount Tabor and finally, Tel Aviv. On the eve of my birthday, I had to board a Turkish Airlines flight from Singapore where I was based then with a transit in Istanbul in Turkey before finally heading to Tel Aviv. I would have wanted to fly El Al, Israel’s flag carrier, but it does not fly directly to Singapore; the nearest El Al’s destinations are Bangkok and Hong Kong. I would not want to change airlines so the best option for me was Turkish Airlines, Europe’s best airline. Well, the best Middle Eastern airlines such as Emirates and Qatar Airways (read: Arab airlines) do not fly to Israel. 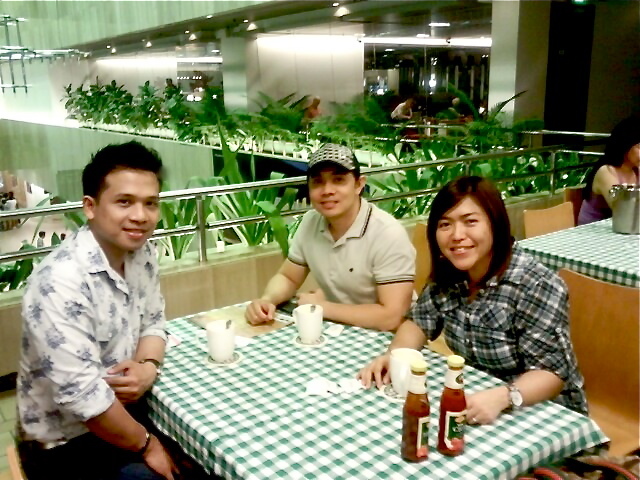 At Singapore’s Changi Airport Terminal 1, I was sent off by my best two buddies, Justin and Geraldine. We sipped inexpensive but very good coffee and chatted for a while, before I passed through the immigration gates on my way to celebrating my most memorable birthday ever. 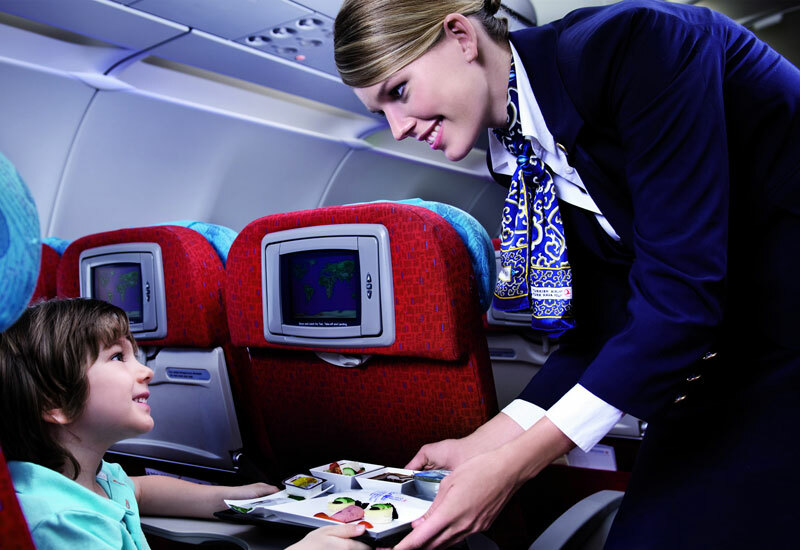 [Photo courtesy of Turkish Airlines.] My first Turkish Airlines experience exceeded my expectations of a European airline but it somehow ranked lower compared with my own experiences with Asia’s best airlines such as Singapore Airlines, Thai Airways, Cathay Pacific Airways, Korean Air, Japan Airlines and All Nippon Airways. Well, I got the usual personal TV and I was seated next to an unassuming and charming Spanish lady who was traveling from Sydney to Madrid. The trip was smooth and peaceful except that there was just this beautiful airline stewardess who was such a clumsy lady and always acted rudely to the Spanish lady next to me especially during meal times. And so I turned 37 years old 37,000 feet up in the air. After 13 hours the plane landed at Istanbul, I passed through the exceedingly crowded and chaotic transit area and after 1 hour, I took the 2-hour flight to Tel Aviv. 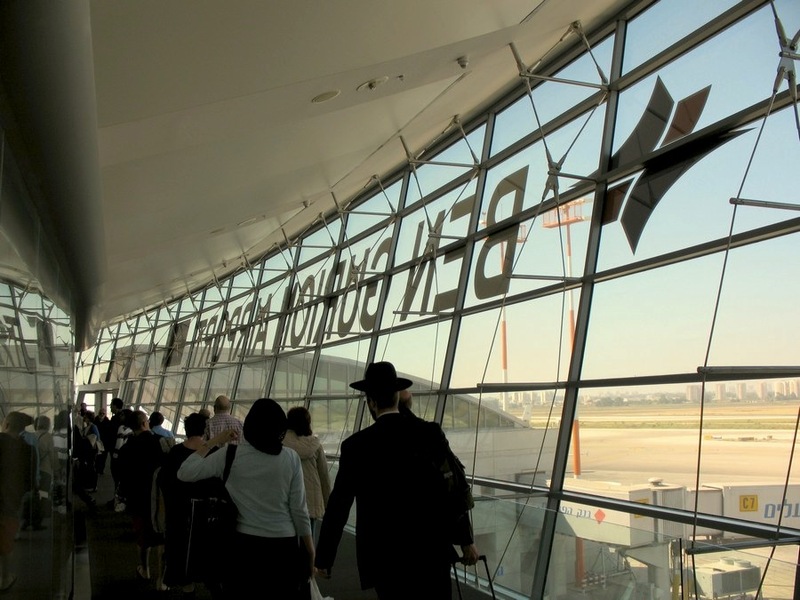 It was a bright Saturday morning when we arrived at Tel Aviv’s Ben Gurion International Airport and I was truly excited for my first visit to the Holy Land. 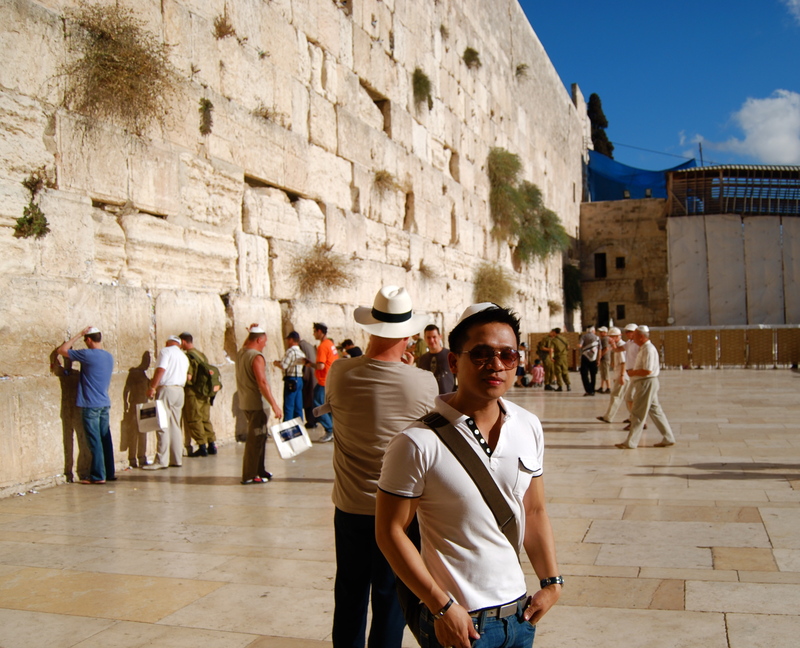 Israel welcomes Philippine passport holders without visas. It is indeed a great privilege to us Filipinos and it is Israel’s a way of eternally expressing gratitude to one of the countries that welcomed the Jews during difficult times when they needed nations to adopt them especially during World War II. Although I was fully aware not to have my passport stamped with the entry to Israel to prevent eventual scrutinized or even banned entry in Muslim countries like Indonesia and Malaysia, I was overwhelmed and I totally forgot to tell the immigration official to have the stamp on a separate piece of paper. 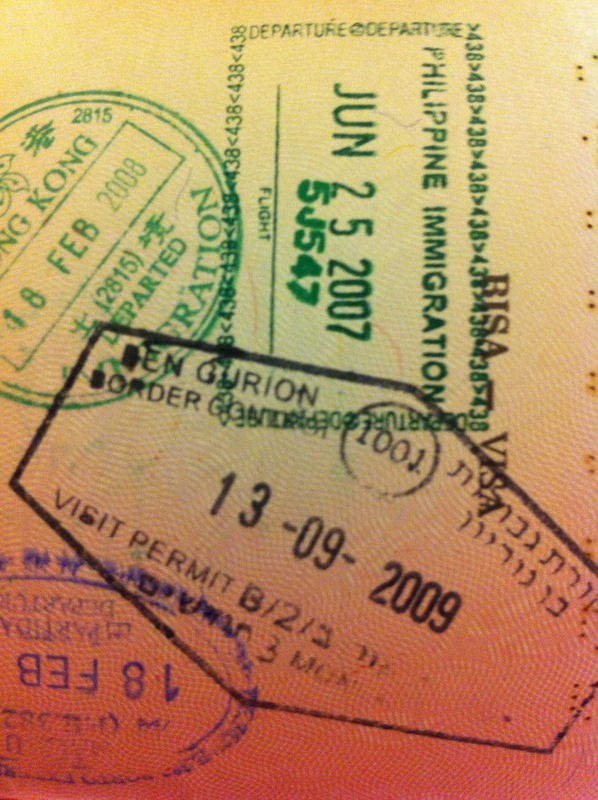 So my old passport had that 13-09-2009 (my birthday) Ben Gurion airport immigration stamp. 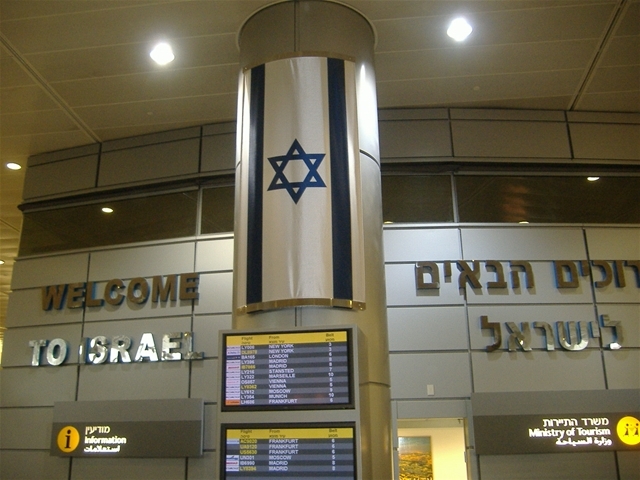 After passing through immigration, I was randomly selected and was questioned by a nice Israeli immigration lady regarding my trip. After 10 minutes, she was finally convinced I was just a plain sojourner and was not an Israeli security threat. After getting past the immigration area, I was immediately in the main lobby of what was considered at that time Middle East’s most modern airport. 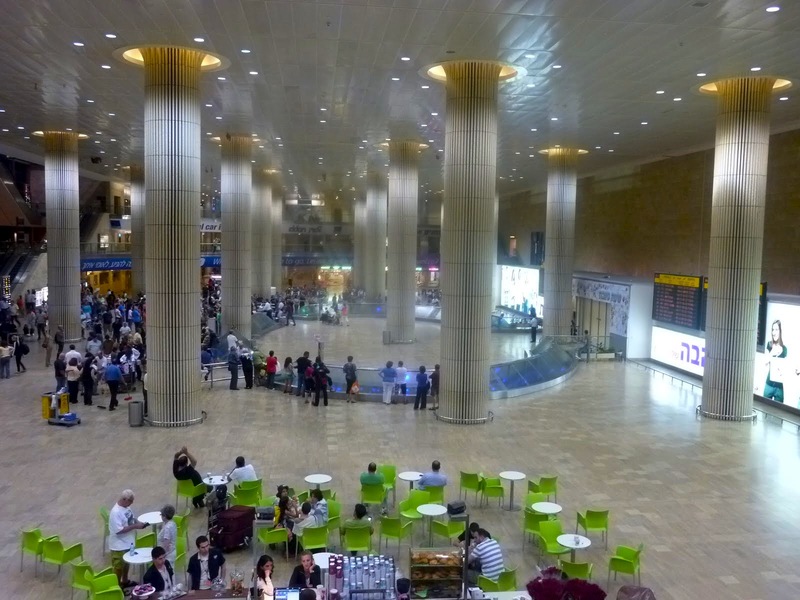 Ben Gurion International Airport was spacious and modern. Just right outside after exiting the airport is the Menorat Hashalom and nearby were the waiting 10-seater sheruts (shared taxi van) bound for different parts of Israel. I decided to take the sherut for 50 shekels in going to Jerusalem as the train would require me to take some transfers. 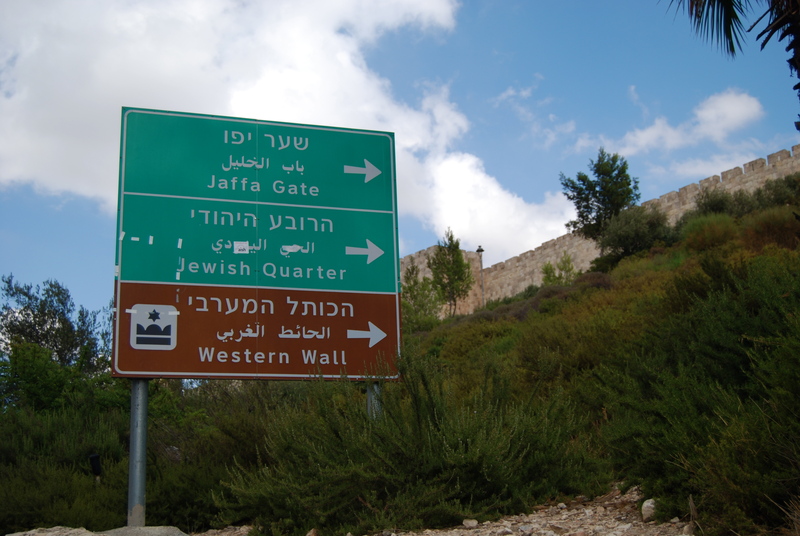 The sherut was actually the best economical and most convenient option to reach Jerusalem from the airport. 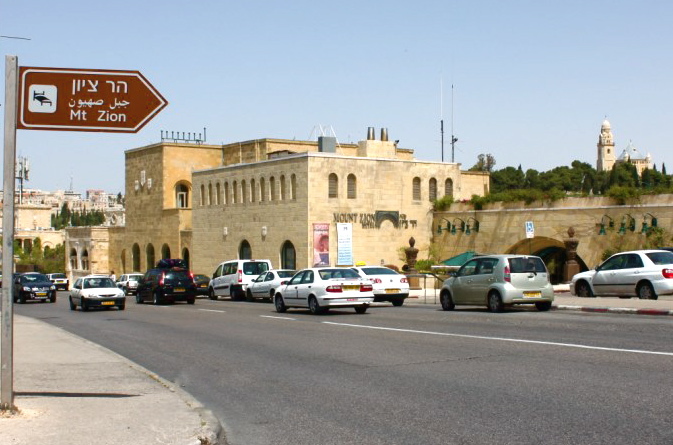 In a little less than an hour, the sherut dropped me in front of my hotel, Mount Zion Hotel, located at Hebron Road. After checking in, I was inside my room and was mesmerized by the view of the Kidron Valley, the valley mentioned in the Bible in John 18. 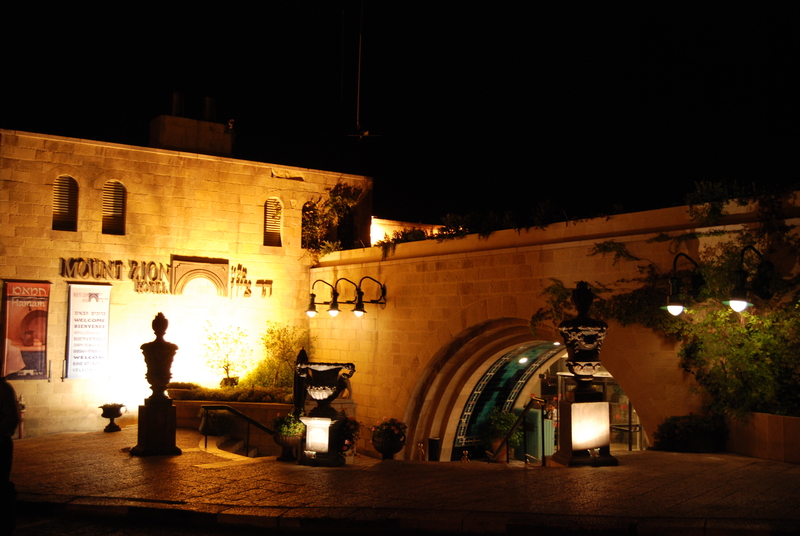 The hotel is actually less than 10 minutes walk to the Old City of Jerusalem. 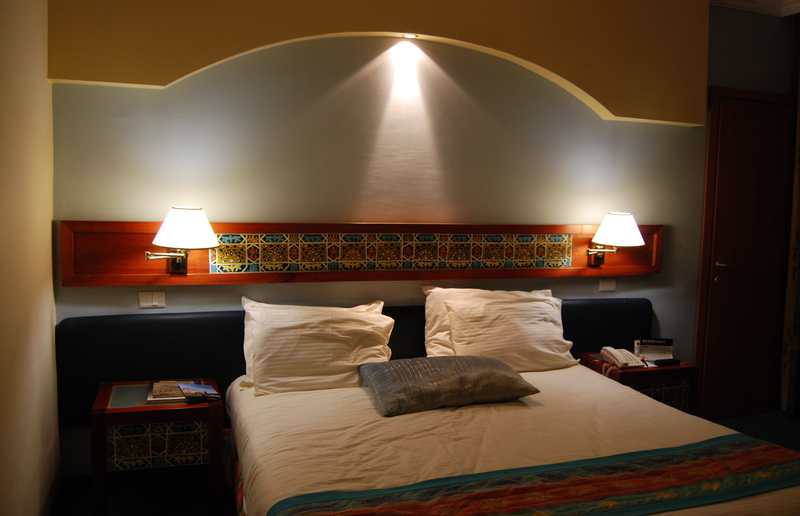 So after booking my Dead Sea and Masada tour for the following day at the hotel reception…. 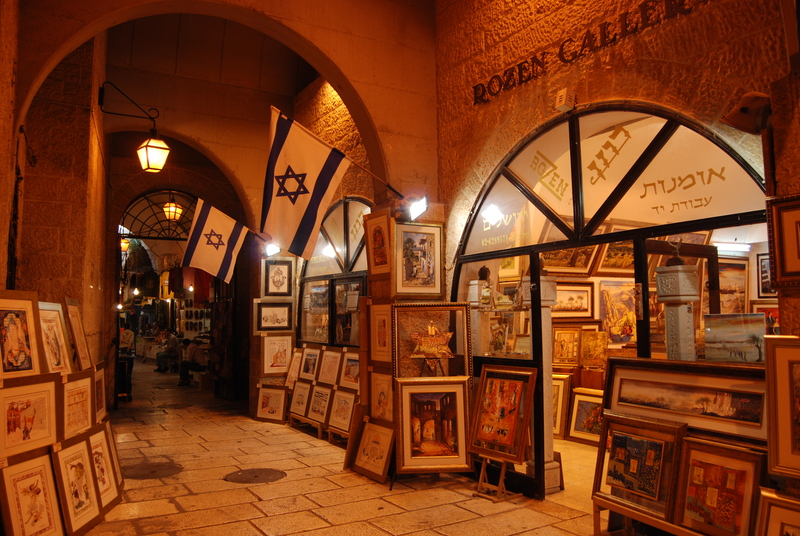 …I was out walking to the Old City. 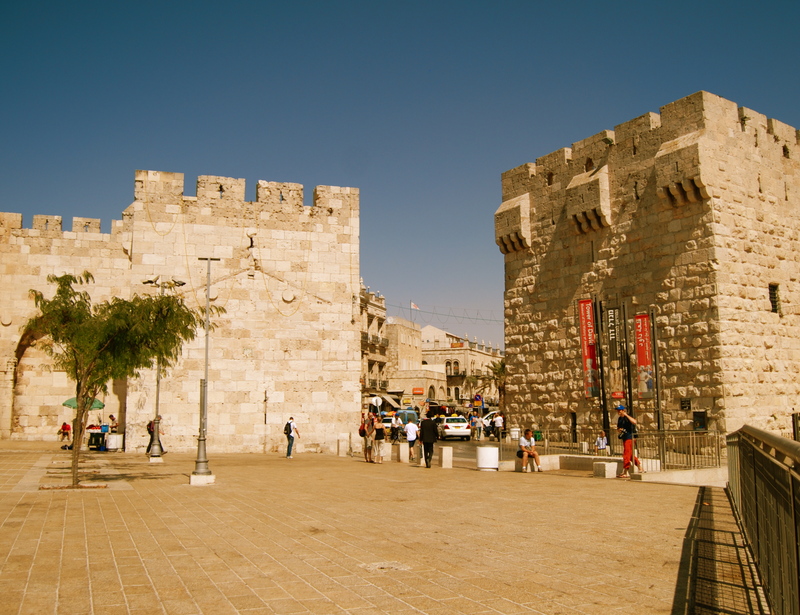 I read from brochures of the free tour being offered by some guides so I went to the Jaffa Gate to check on them. Within a few minutes, I decided not to go with them as I wanted to explore the old city on my own with full control of the time and pace. My first stop was the rooftop of the once elegant Petra Hotel built in 1870 that is now reduced to a status of a hostel. I paid 5 shekels to go up and it was more than worth it. 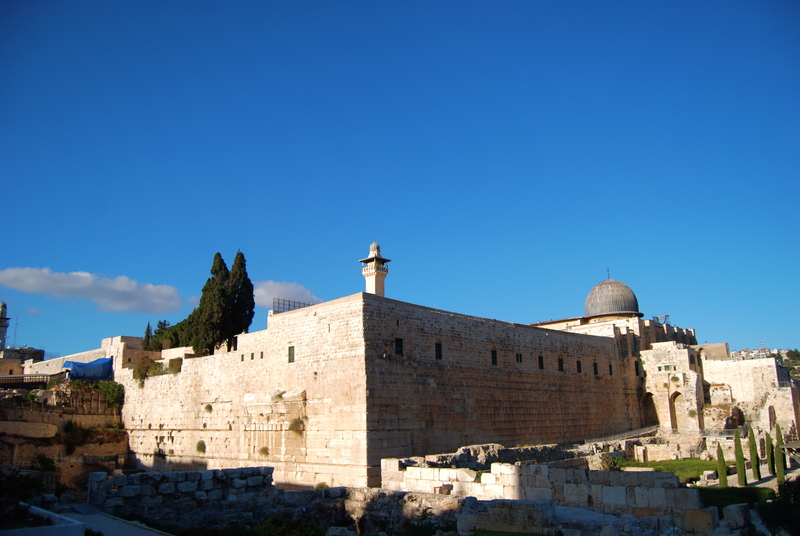 Frommer’s travel guide was absolutely correct; it had a sweeping view of the Temple Mount. As I was setting up my camera on a table for a timer-controlled self-portrait, there were two guys who also came up and one of them took my photo. The left view from the top of Petra Hotel was the Christian Quarter with the silver gray dome of the Church of the Holy Sepulcher, the holiest site in Christianity. I went down from the top of the Petra Hotel and walked to the Jewish Quarter where the Cardo is located. 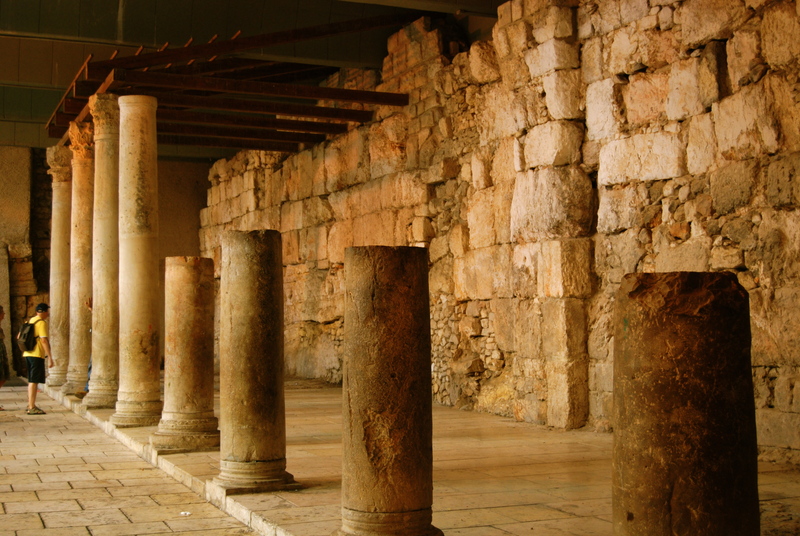 The Cardo is the reconstructed main street of Byzantine Jerusalem. It showed that colonnades run the length of the city from north to south. In general a cardo was a north-south oriented street in Roman cities. Uncovered in 1970s, the Cardo is 6 meters or 20 feet below current street level. A part of the Cardo has been rebuilt as a stretch of modern shops. I was wondering if I could buy King Solomon’s wisdom here. 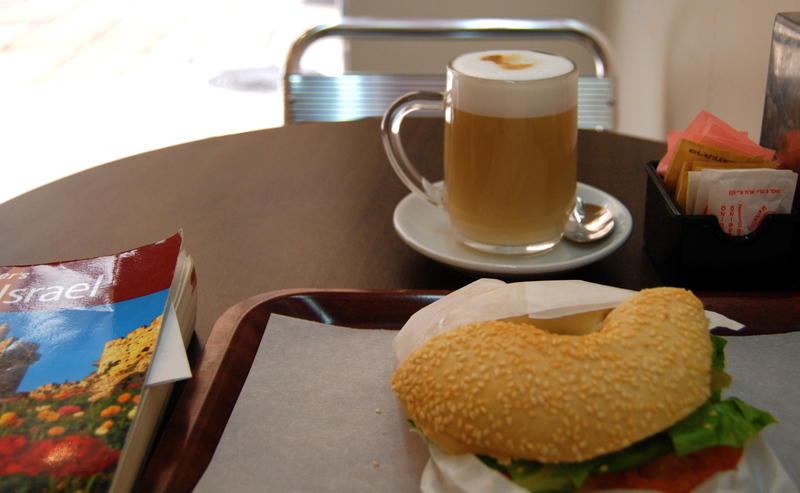 On my way to the Western wall, I stopped for cafe latte and salmon bagel. I needed to recharge myself as I was doing the somewhat exhausting walking tour. 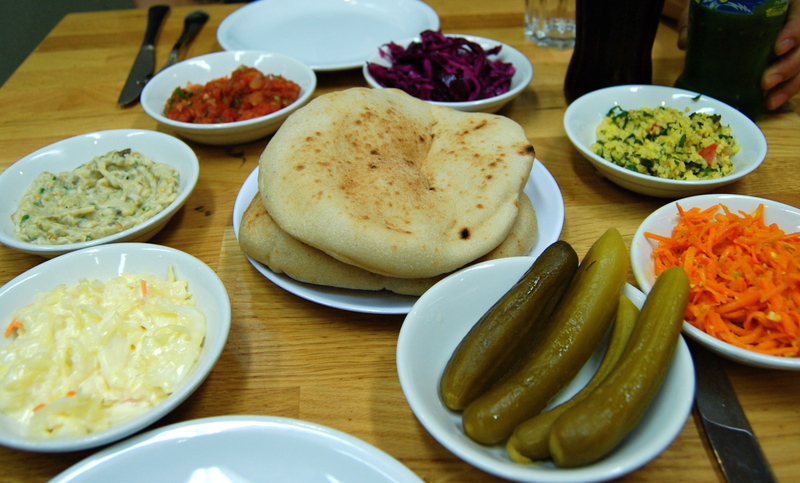 In between sips and bites, I peeked inside my Frommer’s travel guide. I have been using Frommer’s travel guides for my trips since 1998 when I started traveling outside of Asia. 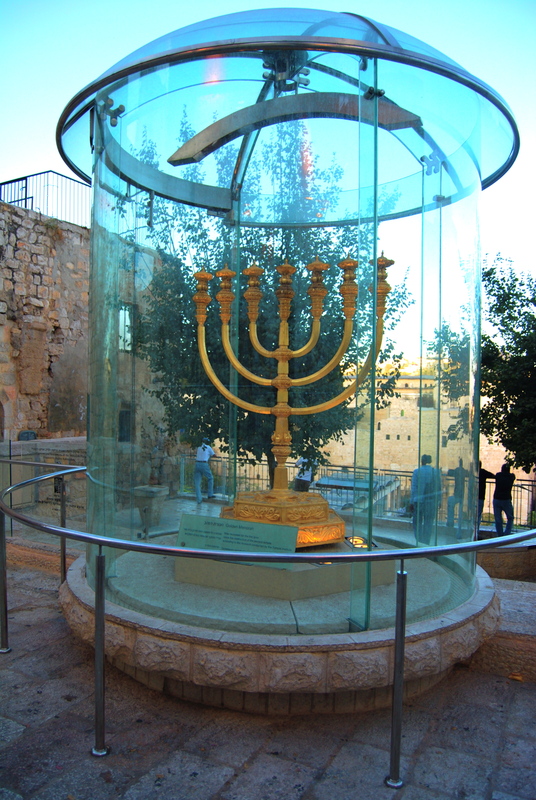 The self-tour continued on and as I passed three more blocks where I rested, I came upon the pedestal going down to the Western Wall. 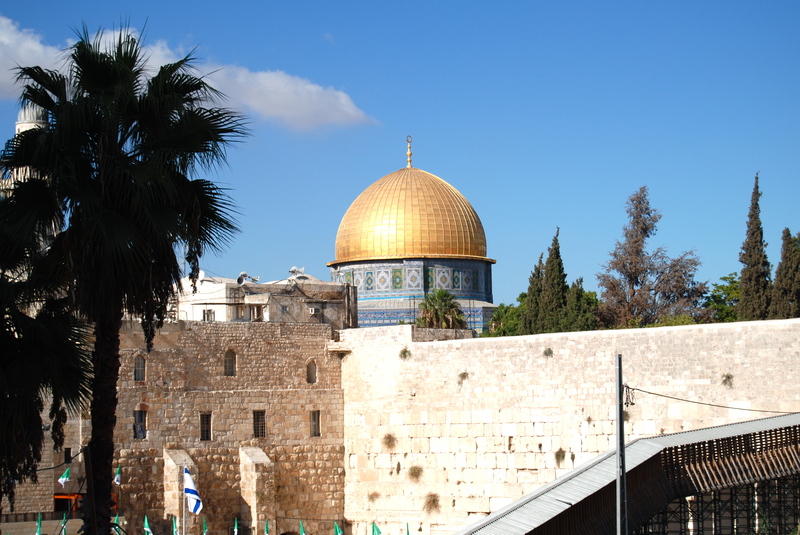 I was thrilled seeing the Western Wall and Dome of the Rock. 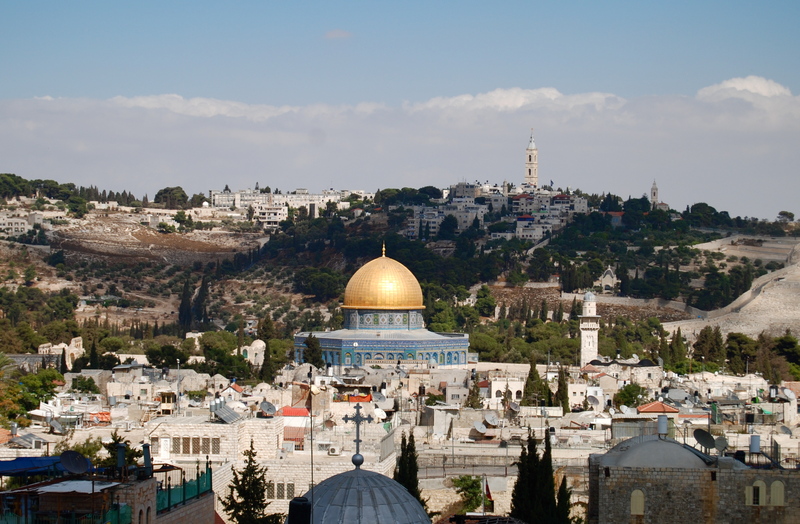 The Dome of the Rock is a Muslim-controlled shrine on the Temple Mount in the Old City of Jerusalem. 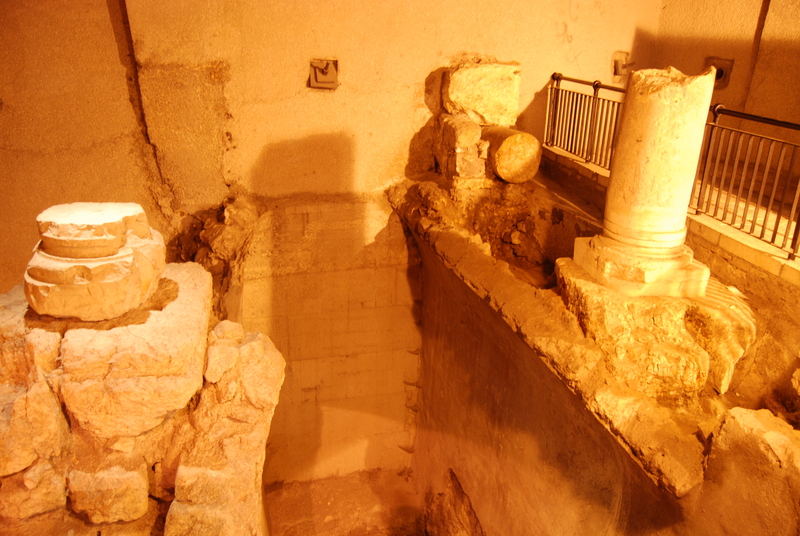 It was constructed on the same site where the Second Temple of Solomon was once standing before it was destroyed by the Romans in 70 A.D. 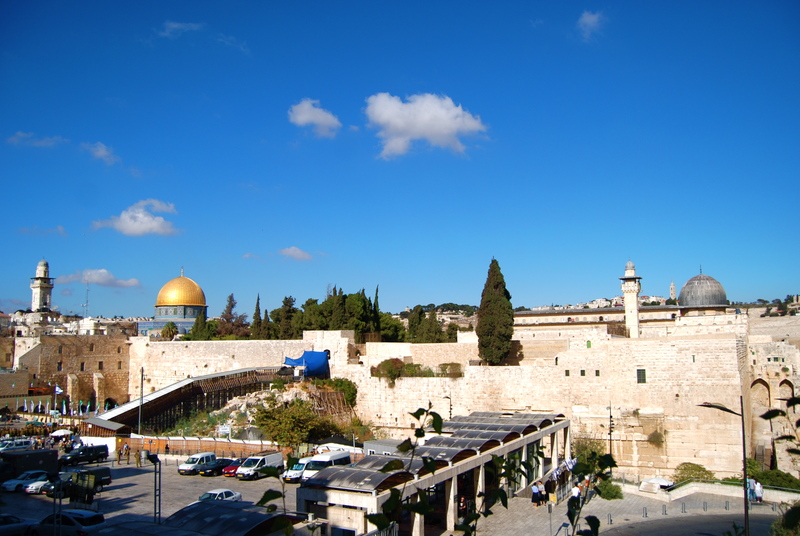 The Western Wall, located at the foot of the western side of the Temple Mount, is what remained of the Jewish temple. 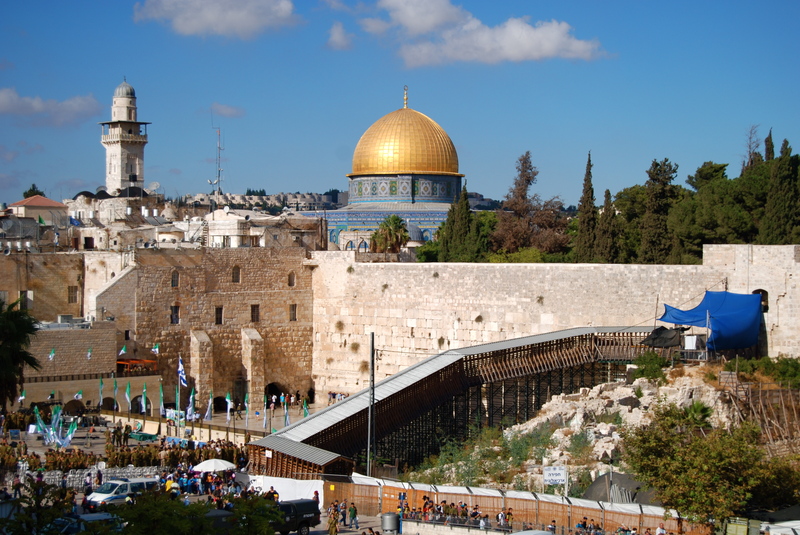 It is one of the holiest sites in Judaism outside of the Temple Mount itself. 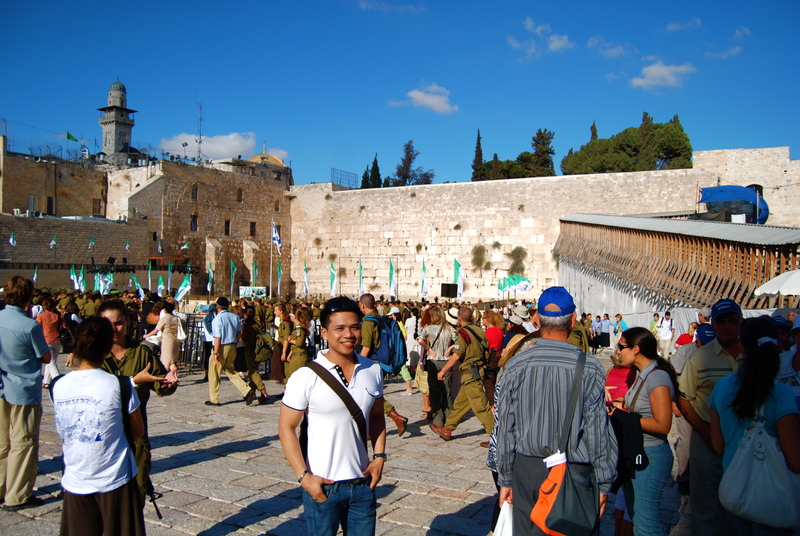 As I approached the Western Wall grounds, it was filled with tourists and soldiers alike. 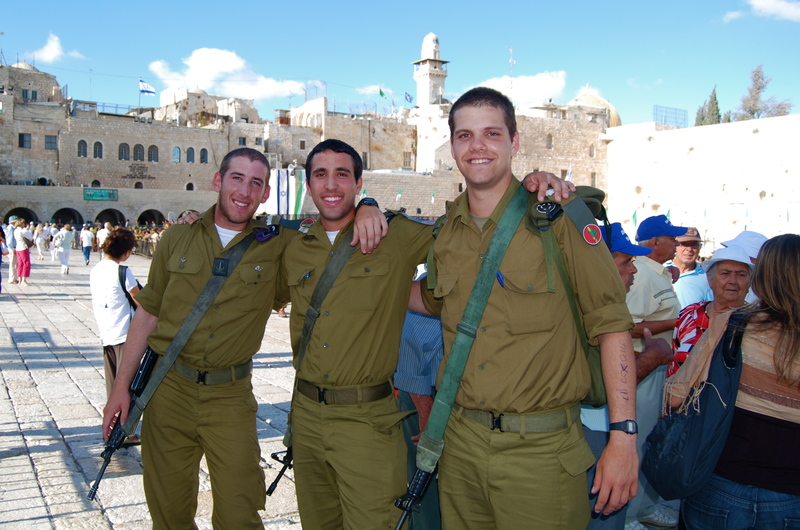 There was a special celebration attended by the young Jewish army. They were some of the soldiers who were eager to have their photos taken. They were nice, funny and entertaining. 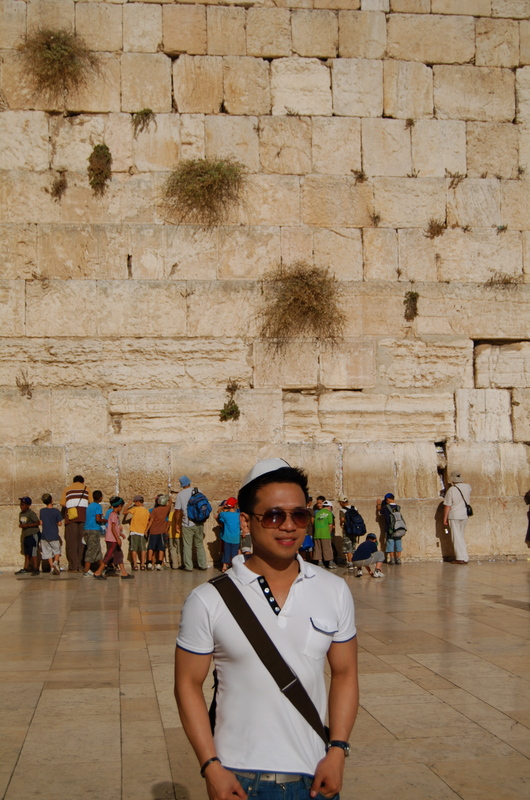 Immediately I proceeded to the Western Wall. I needed a head covering upon entering the area. Tourists and locals pray at the Western Wall. I actually wrote my friends’s prayers as well as my own on pieces of paper, prayed them one by one and slotted them in the wall openings. 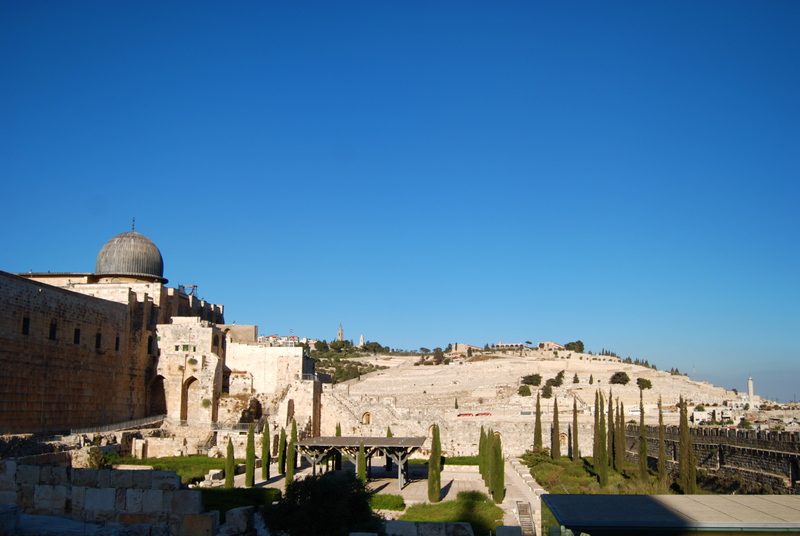 After staying for some time in the Western Wall grounds, watching the special army celebration, I went to the southern side of the compound and took a photo that includes the Al-Aqsa Mosque shown at the right with its gray dome…..
….and another photo of the Mount of Olives with the Al Aqsa Mosque at its left. Interestingly, as I was about to go and celebrate my birthday on my own, thinking of a place where to have dinner, I met two Filipinas on my way out of the Western Wall compound. 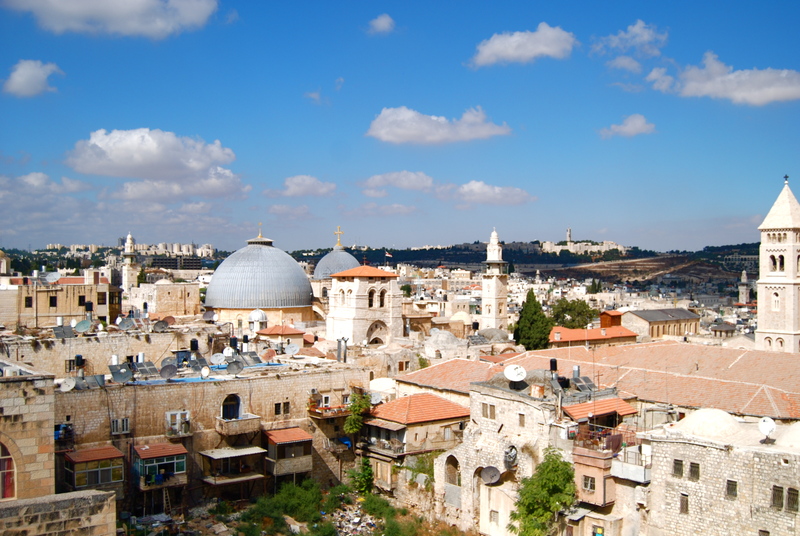 They were working in Jerusalem as domestic helpers. We chatted for a short while and they were actually nice. 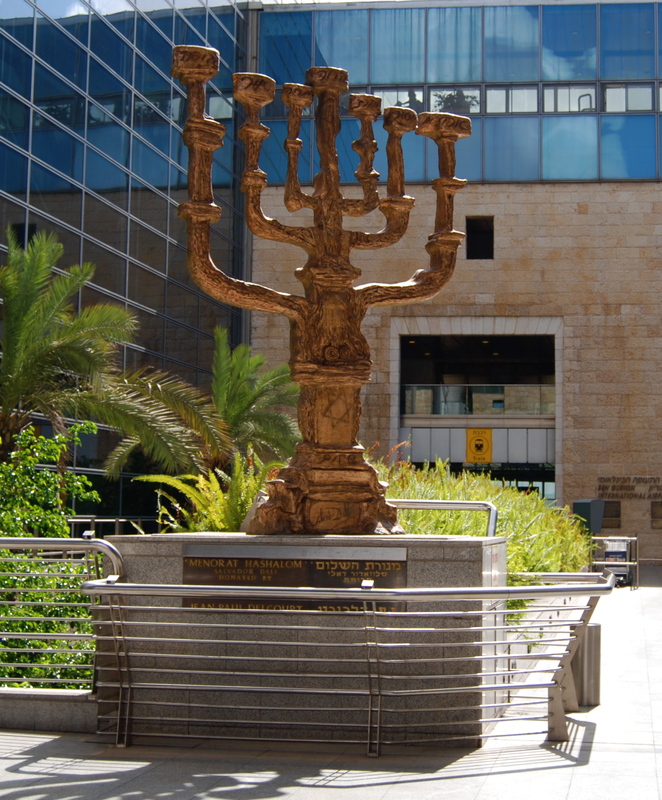 We left the Old City of Jerusalem with a golden meronah as the last thing that caught my camera lens. 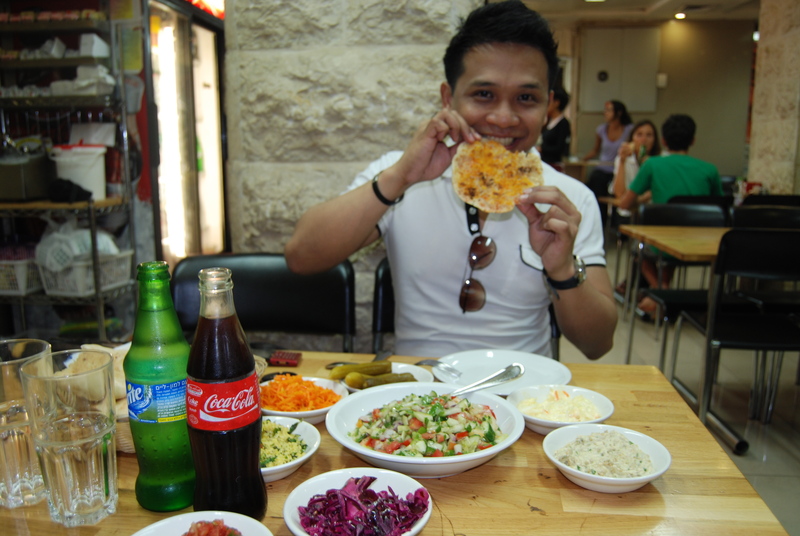 One of the Filipinas had to go home and the other (Mirasol) offered to company me around knowing it was my birthday and my first time in Jerusalem. She toured me around the city and helped me buy a local sim card. 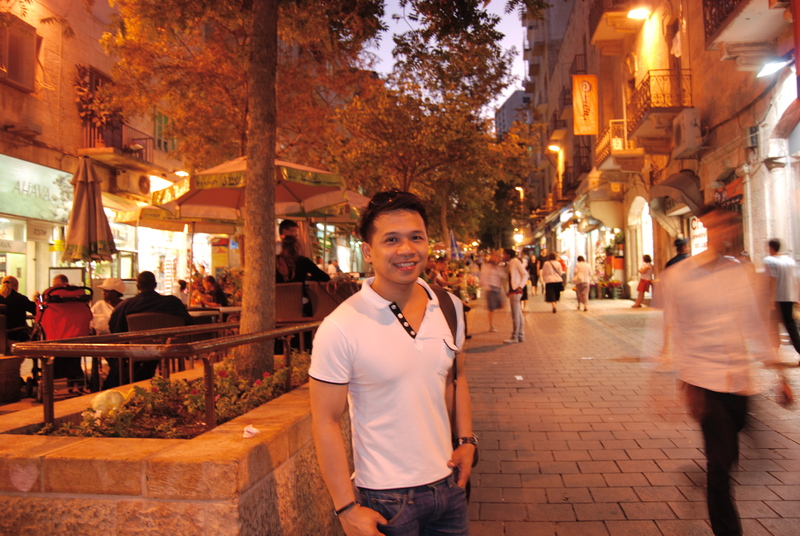 We then proceeded to the famous Ben Yehuda Street which was just near their rented accommodation. 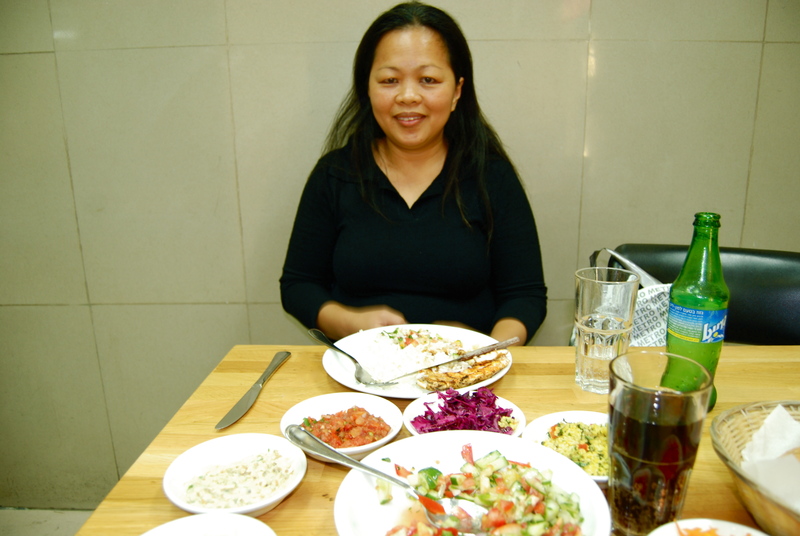 She brought me up to their place and I was able to meet a group of nice Filipinos all working in Israel. Mirasol then accompanied me to a local restaurant and we celebrated my 37th birthday with a kebab dinner. 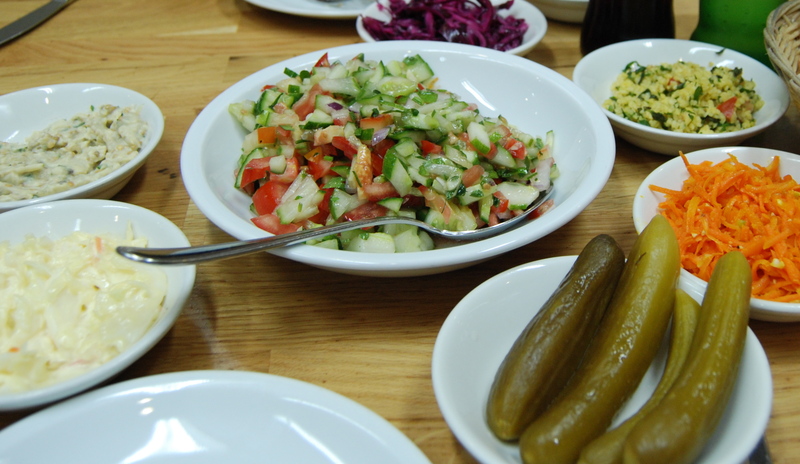 The salad and starters were already very filling. The kebab was served last and it tasted good. The place was nice. It was a different way to celebrate my birthday. 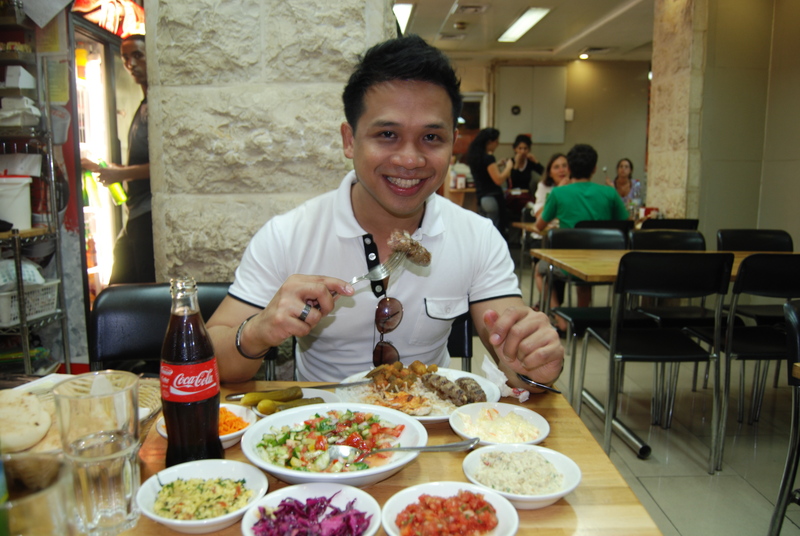 Jerusalem + birthday celebration + kebab+ a friend = an experience that is one for the books. I was thankful to my God that I met Mirasol on that day. A God-given companion, she had stories to tell and one that struck me was that her family members each belonged to different religion or sect from Islam to Catholicsm to a certain sect/cult. Next to that was her experience with her not-so-nice, disabled African Jewish female employer that she was taking care of. She had to lift her most of the time before the husband bought a “lifter”. She was trying hard to stay with them just because the husband (she told me he was nice) implored her to do so. After dinner we walked a little more around the city. Then I bade her goodbye and I took a cab back to my hotel. 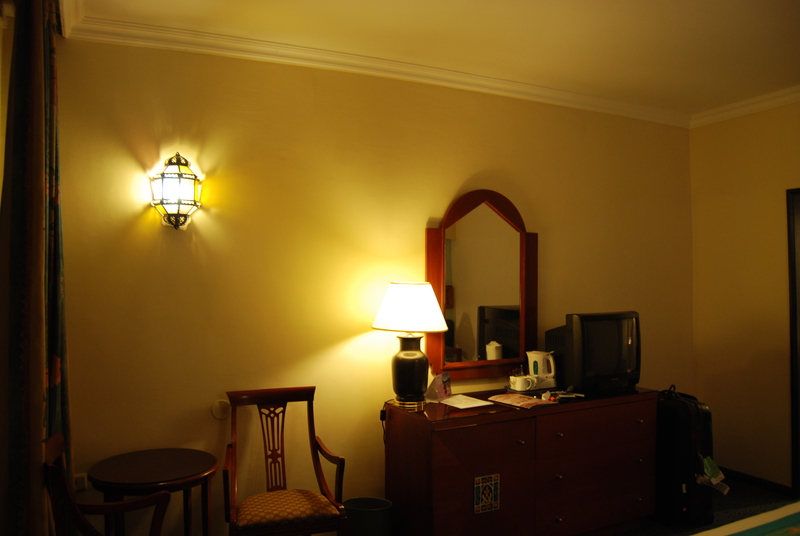 When I returned, Mount Zion Hotel exuded a classic aura at night with all the lightings. 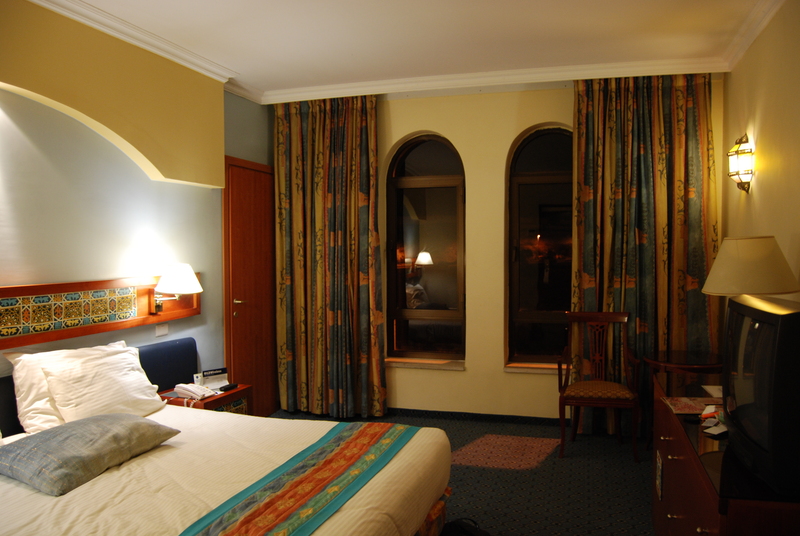 It is not the most luxurious hotel in Jerusalem but its location is amazingly convenient and its stunning views are ones that even the King David Hotel, the city’s most prestigious, cannot match. I had a queen size bed to myself…. …and the simple room amenities. I had to pay extra for the internet but it was just a minimal charge. 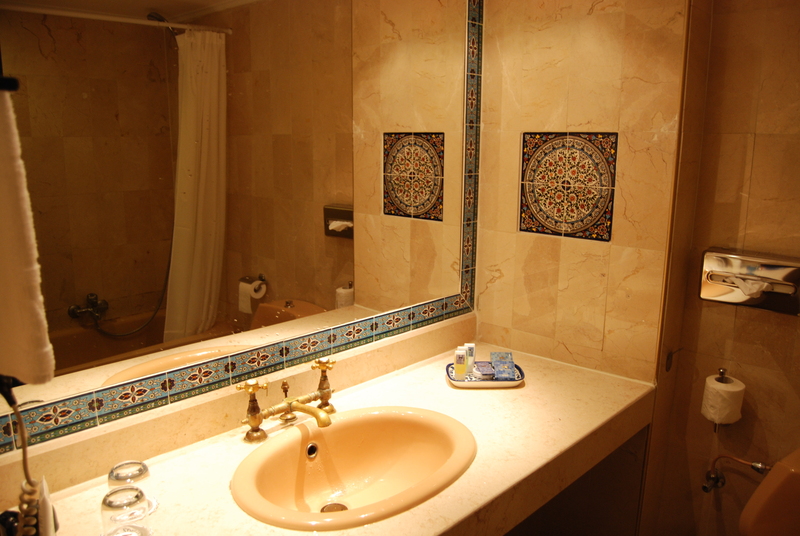 I liked the bathroom’s semi-classic interior. 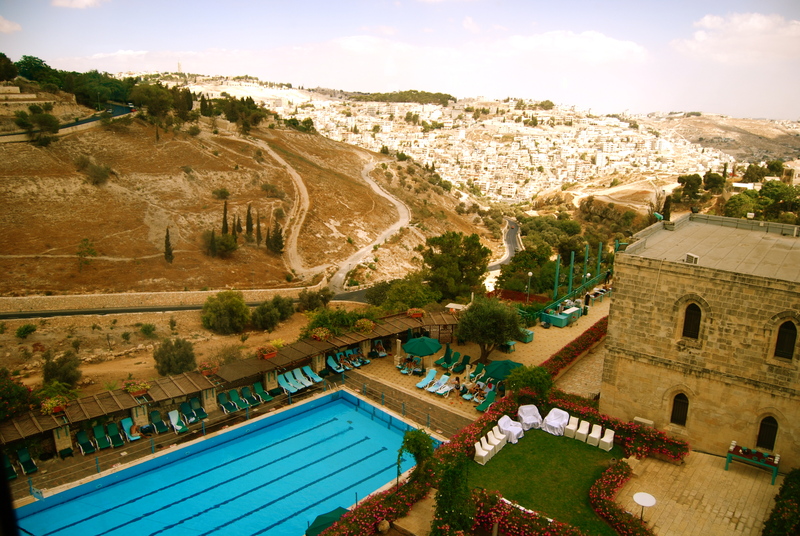 With the views of the Kidron Valley and part of Mount Zion from my room, I could not have asked for a better room and hotel that was within my budget. I spent the night with Facebook, wine and prayer and more prayer. I thanked God for the opportunity to see and walk the land where His Son walked. It was an unforgettable first day in Jerusalem, the Holy City, the Golden City, the Eternal City. No other city means so much to so many people with 4,000 years of history in the footsteps of kings, emperors, prophets and the Son of God. 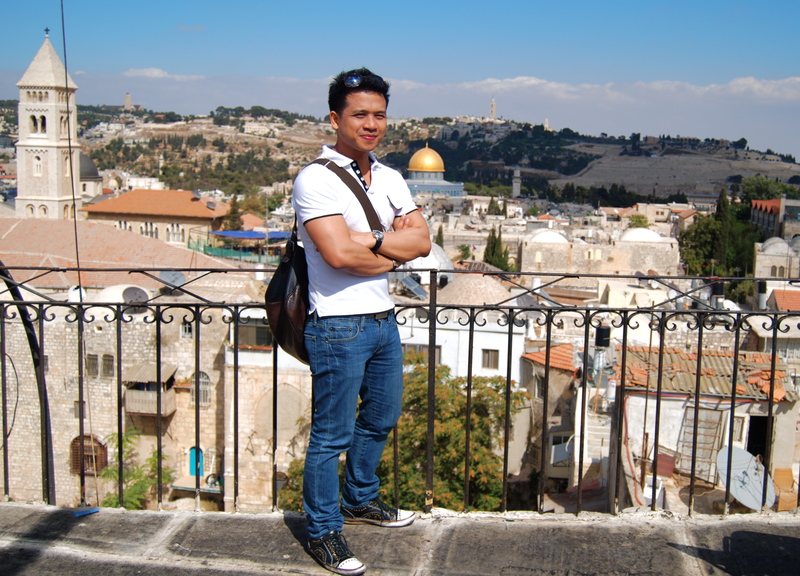 NEXT=> Jerusalem’s Mount Zion, Church of the Holy Sepulcher (Christianity’s holiest site) and finally Gethsemane & Mount of Olives. give yourself 2 weeks to travel the entire israel but if you do not have time then a week or so can take you to the top destinations.